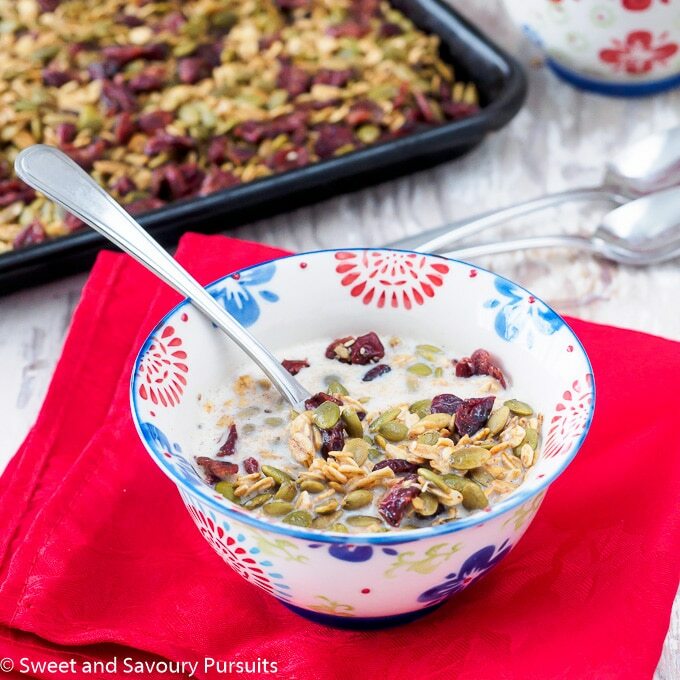 This Healthy Pumpkin Seed Granola is full of good for you ingredients. It comes together quickly and can be eaten for breakfast or as a healthy snack. Happy New Year! I hope everyone had happy holidays, I know mine were filled with family, friends, good food and lots of great times. I’m slowly getting back into the groove of things and prepping for my return back to work and to school for the kids. This means I need quick and healthy breakfasts and snacks. 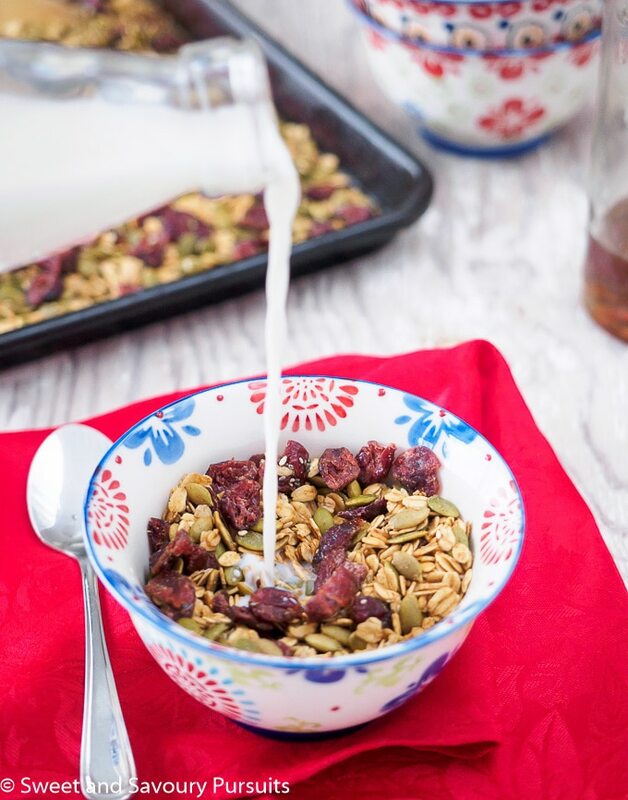 I’m starting off by preparing this easy Healthy Pumpkin Seed Granola. This nut-free and gluten-free granola is loaded with delicious and healthy oats and seeds. Pumpkin seeds (pepitas) which are full of fiber, vitamins and are a great source of the mineral zinc and anti-oxidants. I also added chia seeds which are very high in omega-3 fatty acids, and sesame seeds which are also rich in minerals and vitamins. Still in the holiday spirit, I decided to flavour this granola with cinnamon and a pinch of cloves for warmth and some ground ginger for a little zing. Cranberries are included to add a bit of sweetness and tartness to the granola. The end product is a lightly sweetened and perfectly toasted granola full of texture and flavour. Granola is wonderful for breakfast but it can also make a delicious and healthy snack. This recipe is easy and quick to make, which is perfect when you have a lot going on and you’re short on time. The recipe yields about 4 cups of granola, so it’s not a huge batch. For maximum freshness, I prefer making small batches that can be eaten in about a week. But if you want to make a larger batch, the recipe can easily be doubled, just make sure to use two sheet pans when baking. As an added bonus, baking your own granola makes your house smell amazing. Enjoy! 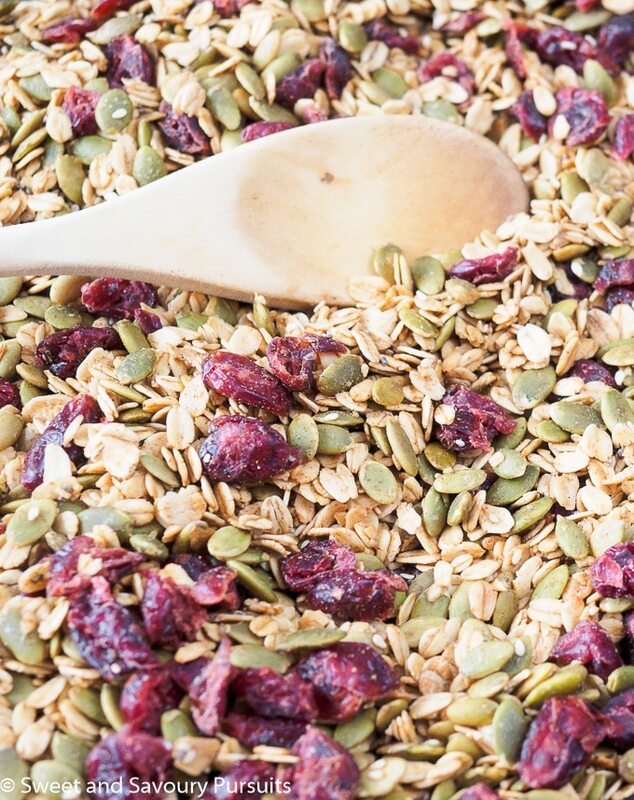 This Healthy Pumpkin Seed Granola is full of good for you ingredients. It comes together quickly and can be had for breakfast or as a healthy snack. In a large bowl, combine the oats, pumpkin seeds, chia and sesame seeds, cinnamon, ginger, cloves (if using) and salt. Add the melted coconut oil, the maple syrup and vanilla, stir well. Spread on a large oiled baking sheet. Place the baking sheet on the middle rack in the oven. Bake, stirring the granola every 10 minutes. Bake until granola is fragrant and toasted to your liking, approximately 20 to 25 minutes. Remove from the oven and let the granola cool before adding the cranberries. Stored in an airtight container, this pumpkin seed granola will keep well for a week. Yes, I’m right with you on that 😉 Thanks! Thanks Nancy! It will be interesting to see if we do it again this week! Oh gosh, this is so chock full of goodness and I need to get back to being more disciplined in the new year. Great combination of ingredients. Thanks for the needed push! Thanks Robyn, I agree but somehow discipline is so much more difficult when it comes to food, especially when baking is your favourite activity! This is so healthy – fiber, fiber, fiber! And the dried cranberries are so pretty. My thoughts exactly, thanks Louise!